documentation for martial arts and combat instruction. Period. We really know how important it is to have the right certification & licensing in our industry. As an Association we are proud to offer internationally recognised & respected martial arts instructor certification, licensing & membership for every member of our Association – all included within the membership fee. Our certification is accepted by leading insurance providers in the UK and by Associations, Governing Bodies, Leisure Centres & Businesses up and down the country & abroad. To our knowledge, we’ve never had a member’s certification turned down or refused by any insurer or organisation – a testimony to it’s quality and design. 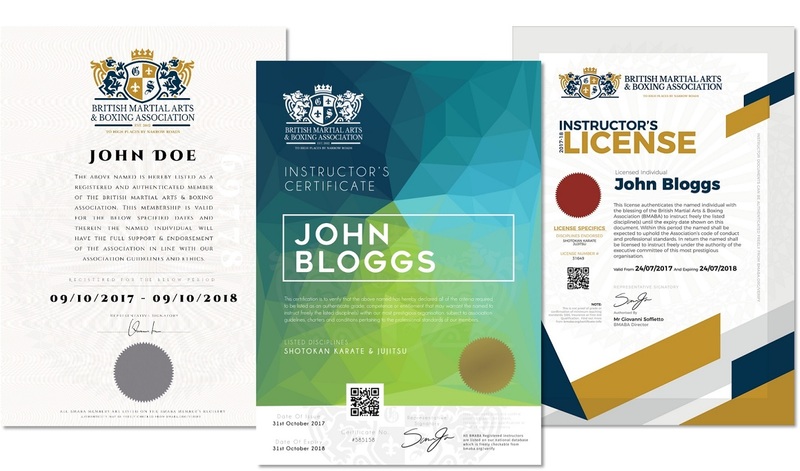 We recognise that in our modern industry a single piece of certification doesn’t necessarily cut it, which is why we offer 3 pieces of certification with all premium memberships to ensure you get what you need without paying extra. Break away from the cheap & nasty, ‘home-made’ certificates dished up by some Associations and join us today for the recognition you deserve. Every piece of documentation we issue is instantly checkable from anywhere in the world thanks to our leading online systems too, for extra peace of mind. Recognised by many as the pinnacle of achievement, the BMABA instructor’s license is only given to those who can demonstrate a range of key criteria such as DBS checks, first aid training, safeguarding qualifications, proof of grade and more. Our association can provide all of the tools, services and support required to help you attain this prestigious license. No more bringing hoards of paperwork with you to classes or lectures. 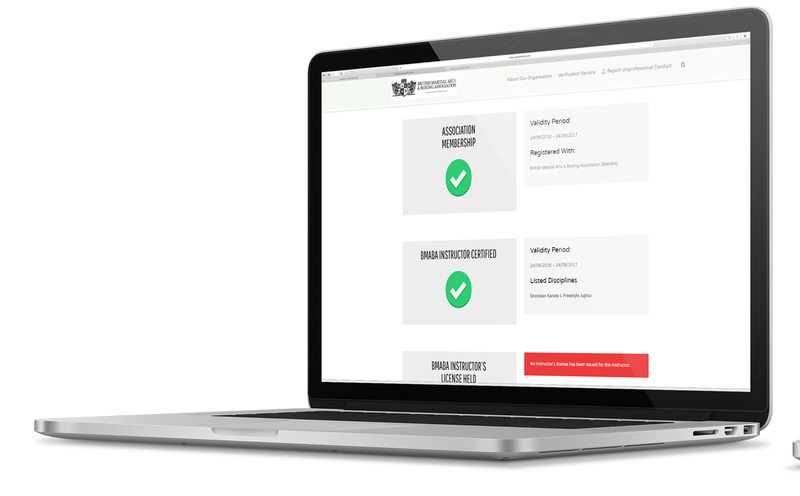 Enjoy a live-time update of your instructorship, membership, licensing, insurance, DBS, safeguarding, first aid and more from a secure account page, viewable from anywhere in the world. What’s more, all of your documents are linked via a unique serial or QR code that will take inquiring parents, students or schools straight to your records page. Enjoy full vindication for the time spent making sure you’re safe to teach, exclusively with the British Martial Arts & Boxing Association. Explore the 3 key pieces of documentation available to every paying instructor member of our association. 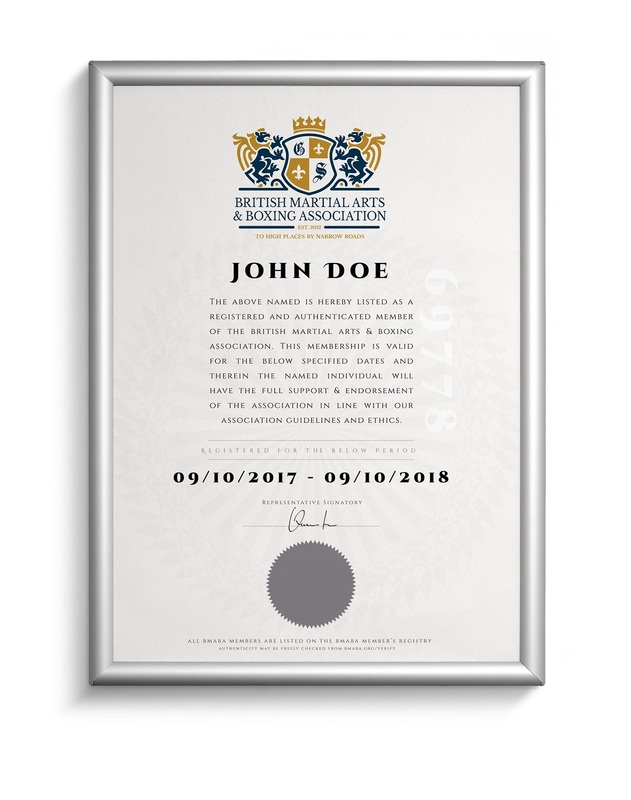 Our association membership certificate is available to every member of our association, including those joining us for free. This certificate confirms your membership and affiliation to one of the UK’s most prestigious martial arts associations for instructors and senseis. Available with all memberships, including free affiliation. 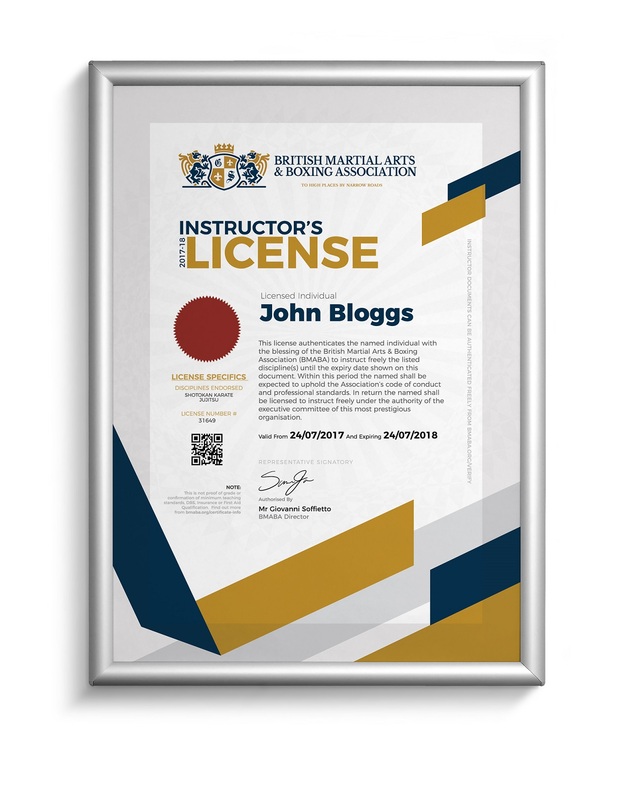 Because every member of our organisation must present proof of grade before joining as an instructor, your instructor’s certificate helps you consolidate all of your senior grades and disciplines onto a single certificate that clearly shows the public, students, parents, schools and venues that you’re qualified to be teaching what you do. 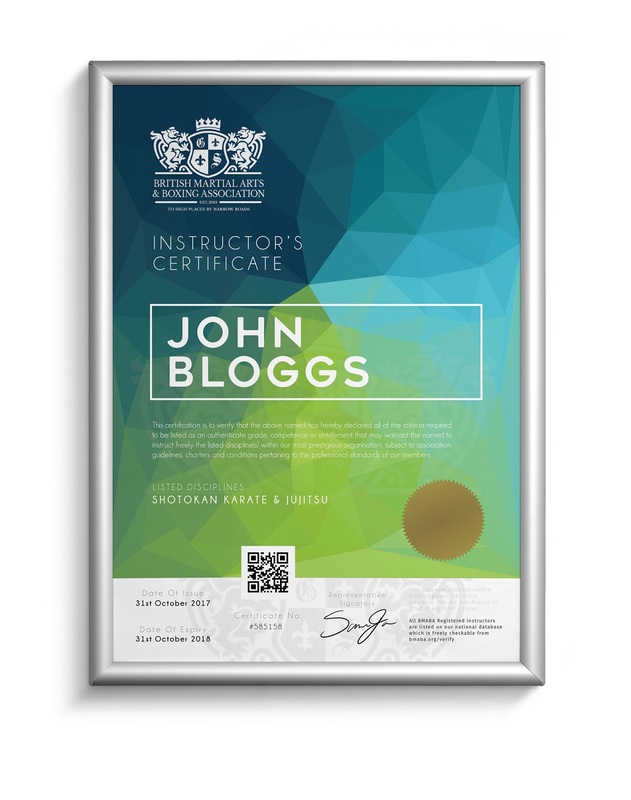 Attainable only after demonstrating a range of key features – such as insurance, DBS, first aid, safeguarding and more – but also included in the price of any paying (premium) membership, our instructor’s license is one of the most respected documents in the industry. Show the world you’re serious about being one of the top 2% by qualifying for one of the most exclusive instructor’s licenses available anywhere in the industry. No more scanning, photographing or home-printing. Our certification is made available to you in a manor of ways, depending on the membership you opt for. Beautifully, professionally printed documentation complete with foils, stamps and security tags. Enjoy your instructor documentation in PDF or JPG form to easily share, download, display or send via the internet. That Will Do You Justice. We know how important making the right impression can be. That’s why we’re proud to offer customisable and professional photographic membership ID cards for all of our instructors as a completely optional extra. Superb quality, professionally printed & available with a range of accessories, our photographic membership ID cards will really help you make the right impression. We can also offer custom ID card printing for your club, business or brand. 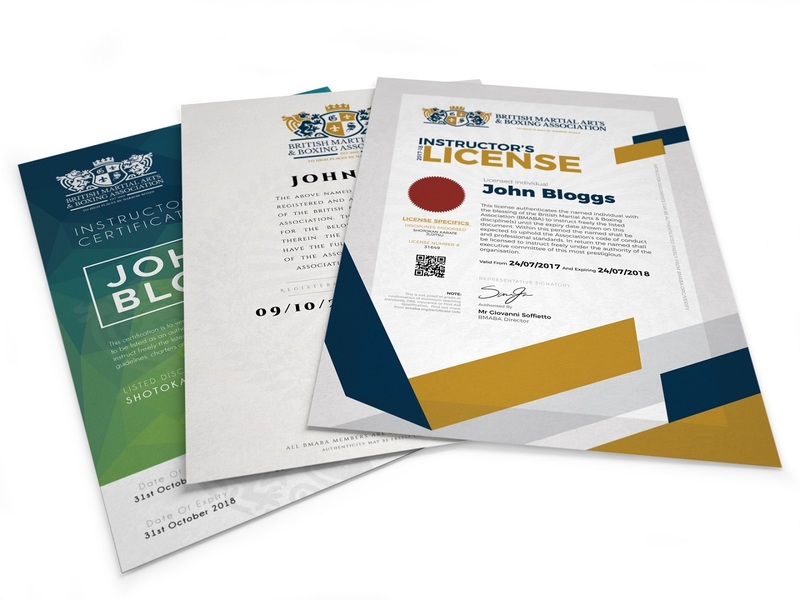 We’re very proud to offer our own in-house professional certification printing service, which allows us to produce professional quality documentation ourself. This means we can offer printing services at greatly reduced costs and, rather than buying in bulk from a supplier & manually writing over the top, we’re in full control of the quality of each document issued by our organisation. Premium, minimum 220gsm woven gloss material with our office stamp, embossed mark and seal add to the professional print quality on offer. Make sure your certification looks the part and does its part. Unfortunately our industry seems to be full of imposters and for that reason some certification isn’t worth the paper it’s printed on – after all, how can an insurer, association or student be sure it’s genuine? That’s why we link all of our certification & licenses to a national & international database that can be checked by anyone in the world at absolutely no cost. The unique certificate number is linked back to your file & the certification issued so if it’s genuine your potential student or enquirer will be more than satisfied when we manually confirm it’s authenticity. We take the attempted forgery and imitation of our certification / licensing very seriously and that’s why we do everything within our power to ensure all of our certification is truly forge proof. We understand that if it’s not – if it can be copied or faked easily – then the entire reputation and integrity of our respected and internationally recognised certification and licensing is completely floored. What surprises us is how slow some of the other Association’s are being to take measures to ensure their certification can’t be copied. Rest assured, we do everything possible – on both our physical certification and our digital certification – to make copying or unauthorised edits completely impossible. This includes custom embossing stamps, foils, holographic designs, anti-forge inked stamps and more. Find out more about how we keep our documentation industry leading. Whether you’re a sole instructor or have a team of coaches, club licensing is a great way to ensure your club is independently licensed and to show your students and customers you’re serious about quality. We have a range of club licensing options available to cater from single instructor classes through to full time franchising clubs.